(Nanowerk News) The Nanorama Laboratory is one of three interactive educational tools available on the Nano-Platform Safe Handling of Nanomaterials; to date, the platform and the remaining “Nanoramas” are available in German). The “Nanorama Laboratory“, an interactive online tool on the safe handling of nanomaterials, is now available in English. The tool, developed in close collaboration with the German Social Accident Insurance Institution for the raw materials and chemical industry (BG RCI), was devised by the Innovation Society, St. Gallen. It is part of the nano-platform “Safe Handling of Nanomaterials” of the German Social Accident Insurance (DGUV). The “Nanorama Laboratory” was developed by the Innovation Society, St. Gallen, in close collaboration with the German Social Accident Insurance Institution for the raw materials and chemical industry (BG RCI). It offers insights into the safe handling of nanomaterials and installations used to manufacture or process nanomaterials in laboratories. Complementary to hazard evaluation assessments, it enables users to assess the occupational exposure to nanomaterials and to identify necessary protective measures when handling said materials in laboratories. 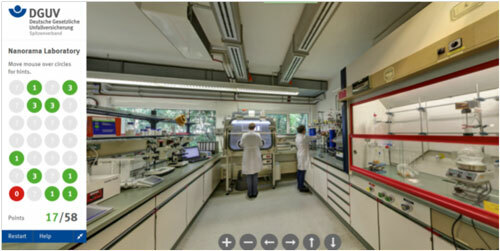 "Due to the attractive visual implementation and the interactive contents, the “Nanorama Laboratory“ offers a great introduction to protective measures in laboratories", says Dr. Thomas H. Brock, Head of the Expert Committee on Hazardous Substances of the BG RCI. The “Nanorama Laboratory” inspires curiosity in users and instigates them to reflect on the conditions in their respective workplaces. "By exploring the “Nanorama Labora-tory”, laboratory staff actively deals with occupational health and safety in laboratories and its practical implementation with regard to nanomaterials." A “Nanorama” – a lexical blend of “Nano” and “Panorama”, – is a novel 360°-E-learning module in which the user enters a virtual space and moves around in it. By completing a “Nanorama”, users acquire knowledge in an entertaining manner. “Nanoramas” can be applied in many areas of education and communication. They were developed by the In-novation Society, St. Gallen. More information on the tool can be found here. The remaining modules, the “Nanorama Construction” and the “Nanorama Car Workshop” can be visited on nano.dguv.de/nanorama/bgbau/ and nano.dguv.de/nanorama/bghm/, respectively. They offer insights into the use and applications of nanomaterials in the construction industry respectively in car workshops. The existing “Nanoramas” will be joined by another “Nanorama”-module soon.